I started the week right because with my new found friend praying for me on everything, and about my running, I was able to run much more in the last few weeks than couple months before. I saw improvement. Last week I was able to put in a solid 40 miles. This week, I already had 20 miles from my long run. I had a wonderful time on my long run yesterday. I broke it into two sessions, not intended but that is part of life, that I couldn’t fit them in one session. I ran the first session after the morning church. I have been attending the morning church (Sunday school or Adult Bible Fellowship is the actual name) the last couple of weeks. Afterward, had lunch with my friend before I hit the trail. 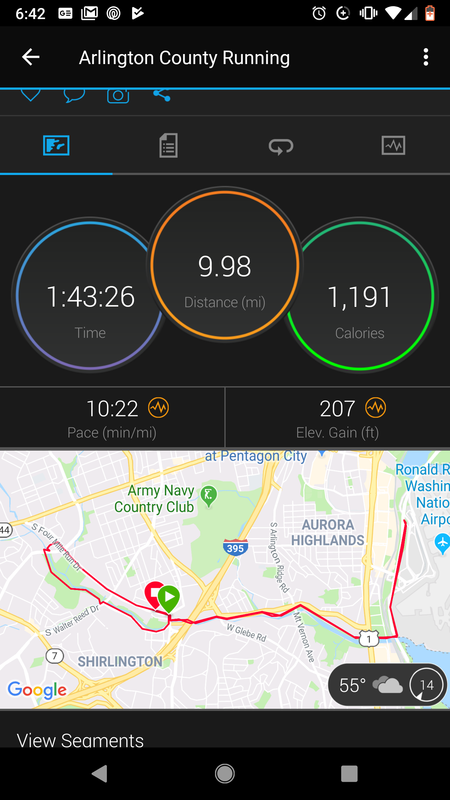 I did the same as in the previous week, I went to a nearby trail that I was kind of familiar with, known locally as the W&OD (Washington & Old Dominion) in Arlington, VA. The first couple miles was difficult. I was a bit tired and food I guess just barely digesting (15-20 mins after meal). My muscles too hadn’t warm up. It was slugging through. I ran couple paces and walked couple places. I also was in need to use the bathroom, and hated myself of forgetting to use the restaurant’s facility earlier. Now on trail, I didn’t want to drive to a place to do my business. My run already started late enough, I wouldn’t have enough time if I drive around. So I kept on running and hopefully would pass by a bathroom at a picnic area. I though about going behind a tree but I was on one of busiest trail and I was in the urban area, people don’t do this kind of thing! I did pass a picnic area but there was no bathroom there. Fortunately about couple miles later, I saw a potty John. Perfect. After doing my business, the rest of my run almost on wings and my feet barely touched the ground. I ran all the way to the airport and back. There was where I biked last summer and it felt significant now that I was running instead of biking. I got a much better understanding of the trail being on foot instead of on the bike. The weather was warmer, in the high 50s and might have reached 60 (around 15 C). I was in shorts and T shirt. I finished my run early and headed back to church for an evening service. I did my second session in my neighborhood. The temperature already dropped. I think it was in the low 40s or high 30s (4-5 C). It would continue to drop to freezing before midnight. I got home knowing I had to go back out but I was occupied with something and didn’t get out the door until 45 minutes later. The second session was much harder because I was running on tired legs. I did run walk for a time until four miles in when I found my rhythm. I stopped by my mom’s place for water. It is customary that I stop there. I went out again after a few minutes. Probably no more than 10 minutes. The rest of six miles was uneventful. The night was quiet. I got home a little over 10:40pm. Total time on my feet today was 4 hours and 20 miles. I saw a double and maybe even a triple rainbow in the afternoon. I didn’t have my phone on me so no picture. I’m not sure if that was a triple rainbow because I saw two indigo bands on one of the rainbow and that was neat. During the night run, I had a scare thinking I saw a ghost that was always ahead of me, later I came to realize that it was my own shadow casted by light from cars behind of me. That was fun in a weird way. I know, how could I not recognize my own shadow is beyond me. I guess when it is dark and tired, your mind plays tricks on you. I didn’t have dinner either, but the fudge gave me the energy to complete the run.